Niagara Hospice began its grassroots movement in 1980 when the Reverend Robert Cook of the Town of Tonawanda gathered a group of concerned citizens, including co-founder and current Niagara Hospice board member Patricia Evans, to discuss the feasibility of developing a hospice program for Niagara County. As a result of that first meeting the first board of directors was formed in 1984 and the organization became incorporated as an Educational Association. In 1986 a Certificate of Need was presented to the New York State Department of Health by then board president Patricia Evans and in June 1988, Niagara Hospice, Inc. was licensed to serve its first home care patients. Since then, Niagara Hospice has been privileged to serve over 25,000 Niagara County residents and their families. Thanks to a dedicated and hard-working staff, volunteer corps and partners in care, Niagara Hospice has evolved to meet the increasing needs of the seriously ill and their families. 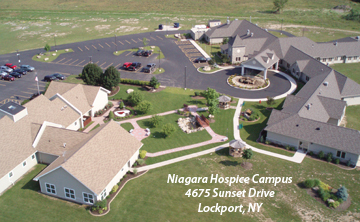 Niagara Hospice is a 501-c-3 not-for-profit organization serving all of Niagara County, New York. Niagara Hospice is a not-for-profit charitable 501-c-3 organization recognized by both New York State and the Internal Revenue Service.